Soon to be seen on HOPE Channel and Loma Linda Broadcasting Network, this is the first of four, made for network television, 30 minute episodes demonstrating the power of nutrition to reverse diabetes and prediabetes. 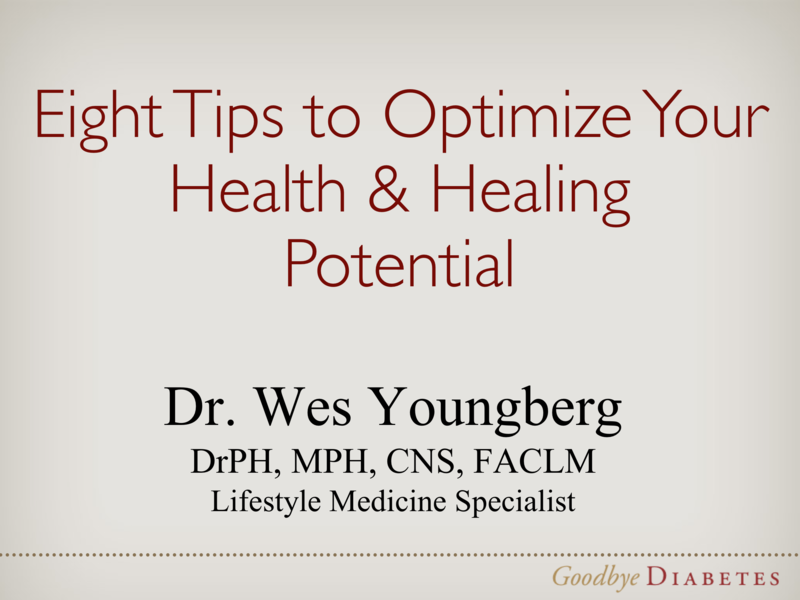 Dr. Wes Youngberg is joined by Brenda Davis who is in his opinion, the most trusted expert and balanced authority in the field of dietetics and nutritional medicine. In these videos they share their expertise on the foods which most effectively optimize the bodies healing potential. The Diabetes Undone program is not just for reversing diabetes but primarily for naturally reversing the insulin resistance which is the primary underlying cause of heart disease, Alzheimer’s, high blood pressure, weight gain, and the growth of cancers. This presentation demonstrates the value of participating in the Diabetes Undone Program. You don’t have to have diabetes or pre diabetes to benefit. This program is effective for anyone seeking to improve their health. If a program is effective in helping reverse the inflammation, metabolic syndrome, insulin resistance, circulation and immune problems associated with diabetes, just think what it can do for everyone else. The bottom line is that reversing the underlying causes of diabetes also reverses the main underlying causes of all chronic diseases. Click on the title slide below to see all 71 PDF slides of Dr. Youngberg’s presentation on January 7th, 2017. All 71 slides are included with all the references and “to do lists” so we can optimize our health in 2017. Click below to download the complete set of presentation slides with six slides per page. Great for taking notes while you watch the video. Join us on Monday’s and Thursday’s in January, April, July and October for this life and health altering program. If you live far from us go to www.diabetesundone.com and join a group based Diabetes Undone program near you. 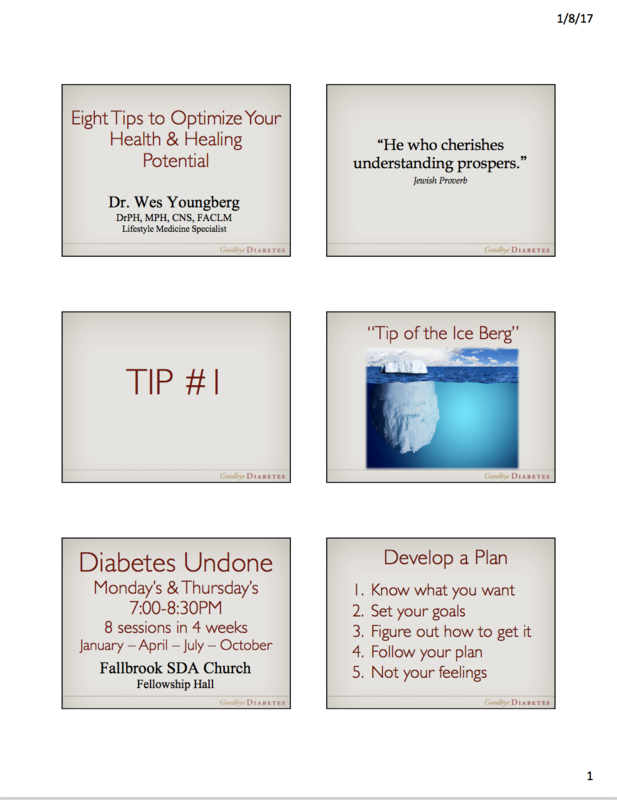 You can purchase your personal Diabetes Undone Kit that includes on-line access to all 40 of Dr. Youngberg’s Diabetes Undone videos, a 100 page Diabetes Undone workbook that guides you through the program and coaches you on how to set goals, and the Plant to Plate Cookbook with over 70 pages of “how to make this work” support guidelines. Jackie’s father had lived with, and died from, terrible complications of diabetes. So when she recently discovered that she had PreDiabetes she became very concerned about her future. Watch Jackie Rosetti’s two minute story about participating in the Diabetes Undone program last October and how it transformed her health. Join Dr. Wes Youngberg and 9 other top experts to learn practical techniques to reverse diabetes. 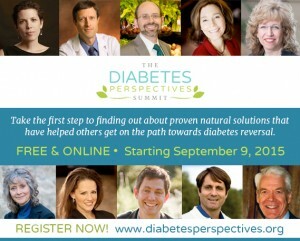 The Diabetes Perspective Summit is a FREE online conference designed to fit your schedule. Two speakers will be interviewed each day to help answer your questions and get you on the path towards better health. Each interview is approximately 40 minutes long and available for re-play 24 hours a day. If you or someone you care about has Type 2 diabetes, your doctor or health professional has probably told you its irreversible. However, exciting new clinical developments and patient case studies now clearly indicate that it can not only be slowed, but actually actively reversed. Im passionate about sharing these developments as widely as possible, so I’ll be speaking at the Diabetes Perspective Summit. I’m privileged to ” share the online stage” there with 9 other top expert speakers in the field, including: Dr. Michael Greger, Brenda Davis, RD, Dr. Neil Barnard, Dr. Caroline Trapp, Ocean Robbins, Dr. Caldwell Esselstyn. Find out more about the Free Diabetes Perspectives Summit. Signing up for the Diabetes Perspectives summit will allow you to learn firsthand from these experienced, cutting-edge researchers, clinicians, practitioners and dietitians. You’ll hear about their work with diabetes patients, and discover the results they’ve personally observed. You’ll learn about how food addictions and corporate politics contribute to diabetes; and how diet and lifestyle strategies can help you stop it in its tracks. Best of all, you’ll find out what’s truly possible when people are empowered to take control of their health. Click here for more information or to sign up Free. You-or possibly someone you know- could significantly benefit form the information and tools that I and my fellow experts will share in the summit. Take the first step toward improving the quality of the rest of your life NOW. Click Here to Replay videos! 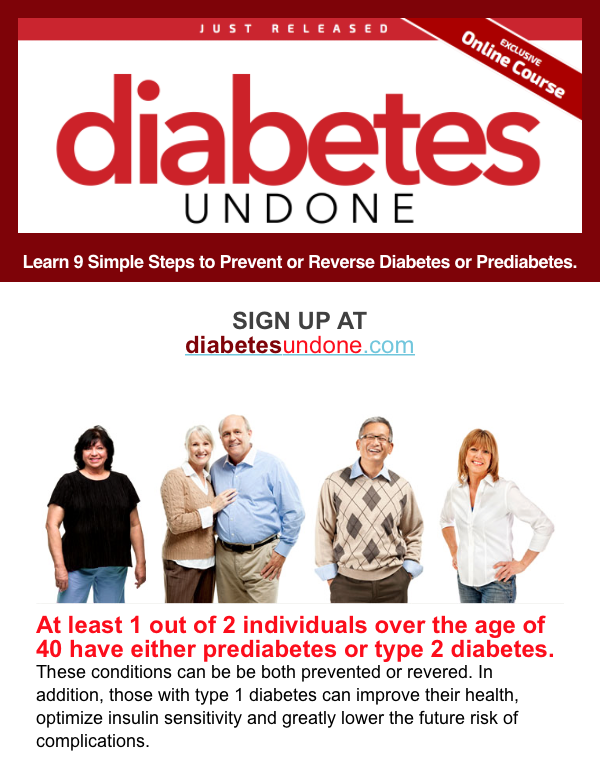 Do you have Diabetes or Prediabetes? Log onto diabetesundone.com and learn from 40 short videos with Dr. Wes Youngberg, and special guest Brenda Davis, world-renowned plant-based dietitian, as they guide you through a hope-filled journey to undo your disease and reclaim your health. For a limited time, you can save $50 and get the full Diabetes Undone Kit for only $99. At no extra fee you get the 275 page Diabetes Edition “from Plant to Plate” cookbook, and you also get the full Diabetes Undone Workbook. All of this for $99. Get your own self help program that walks you through the 9 steps to undoing the causes of type 2 diabetes, Alzheimer’s and heart disease. Diabetes Undone is a program available on-line for individuals, or you can join a group doing this in your area. You can even become the coordinator of your own group! 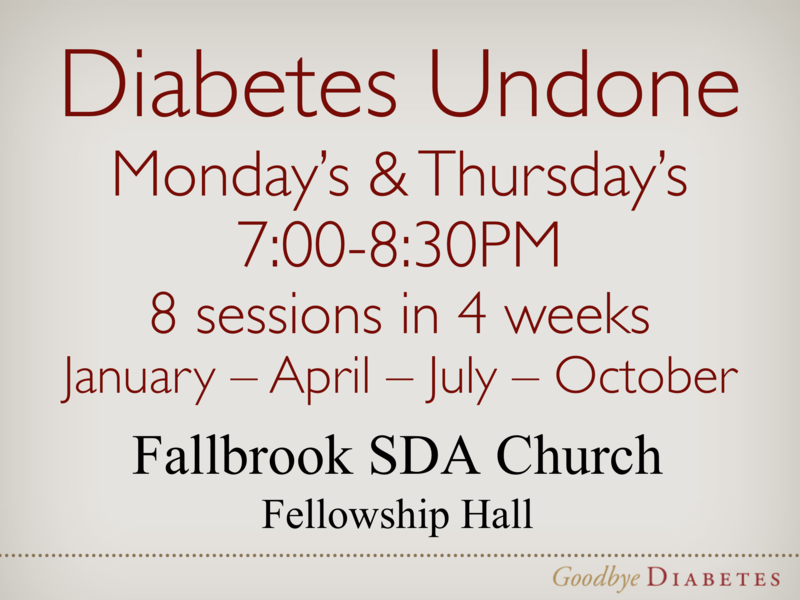 There are many churches, clinics, hospitals and even support groups starting the Diabetes Undone program every month. Check out the places with currently active groups. Here are the organizations planning future groups. Learn how to address the root cause of disease by harnessing the power of simple lifestyle strategies such as nutrition, exercise, stress management, comprehensive testing and much more.